Small things can make a difference - Our future lies in our hands. Everyone stop and think, put your litter in the bin. Save energy - turn off lights and taps. Exercise, play and eat five a day. Try to walk to school - it's good for your health. In July 2009 we were awarded the GREEN FLAG by ECO SCHOOLS WALES. Previously, in 2008 we were awarded the BRONZE AWARD and in 2009 the SILVER AWARD. A special thank you goes to all our Eco Reps, Eco Schools Coordinator Mrs. Eastwood, Estates Manager Mr. O'Hanlan and all children and staff who have helped make our school more green! Eco Schools Wales set us targets by giving us a criteria list to adhere to. Click here to download the criteria list for all three awards. Every classroom and room in the school has a paper recycling bin. All waste paper is recycled to save landfill. We are now making sure that both sides of paper is used before we recycle it. Eco Reps perform Lucky Dips from the recycling bins to see if both sides of the paper have been used before it is recycled. Pictured is a child from Reception recycling paper in a decorated recycling bin. RECYCLING PLASTIC MILK BOTTLES Children from Nursery to Year 2 recycle their plastic milk bottles either by putting them in their classroom's recycling bin or using them as a classroom resource. 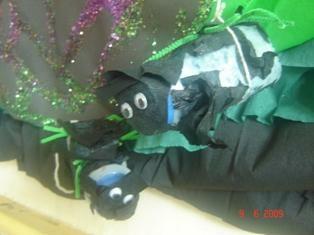 Pictured are two Incy Wincy spiders made by Nursery children! RECYCLING PLASTIC FROM OUR LUNCH BOXES Two recycling bins have been placed in the dinner hall so we can recycle things like plastic drink bottles and yoghurt pots from our lunch boxes. 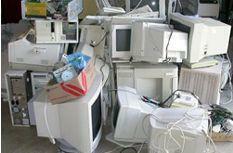 Monitors check whether children are recycling them and not putting them in the incorrect bin. RECYCLING OLD AND BROKEN COMPUTERS The school makes sure that our old and broken computers are taken away to be recycled. This means that the chemicals in the computers do not pollute the earth, and are disposed of properly. We recycle all of our used printer ink cartridges. 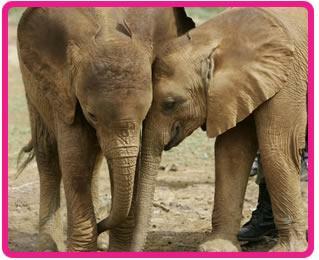 We collect them and then send them off to support a charity that looks after elephants and rhinos in the wild. We can recycle Brother, Hewlett Packard, Lexmark and Canon laser and bubblejet cartridges. We cannot recycle Epson cartridges. Please bring in any from home for recycling - PLEASE DON'T THROW THEM AWAY. We can save energy in school in many ways. This helps us fight global warming. SWITCH OFF LIGHTS that are not is use. SWITCH OFF PLUGS that are not in use. TURN OFF TAPS that are not in use. CLOSE WINDOWS in rooms that are not in use. CLOSE BLINDS in rooms that are not in use. Our Eco Committee and Estates Manager Mr. O'Hanlan checks every day whether each class is doing what they can to save energy by giving a class either a green card for saving energy or a red card for not saving energy. Every week the best energy saving class receives the title of 'Energy Saver Of The Week' and is awarded extra play. Mr. O'Hanlon also checks our energy usage every month to make sure we are saving energy when we can. Litter is a particular problem in and around the school. We would asked everyone to put their litter in a bin or take it home to help make our local environment nicer. 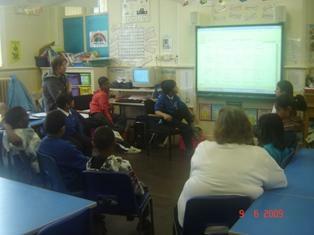 The Litter Warriors were set up in 2008 to improve the litter situation in and around the school. Junior children voluntarily pick up litter at playtime and lunchtime. They also conduct litter surveys and take photos regularly. Together with Teaching Assistant and Lollipop Man Mr. Greenland and Estates Manager Mr. O'Hanlon, the Litter Warriors successfully lobbied Cardiff County Council for two bins to be placed on Virgil Street as there weren't any at the time. 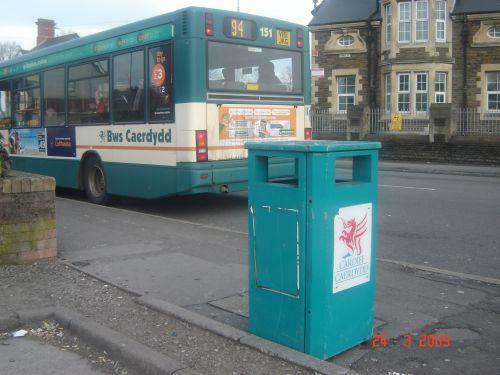 The picture shows one of the bins by the bus stop near Wynnstay Close. The South Wales Echo published a story about the campaign on Wednesday 2nd July 2008. The school has introduced ways to try and get the children to eat more fruit and vegetables. 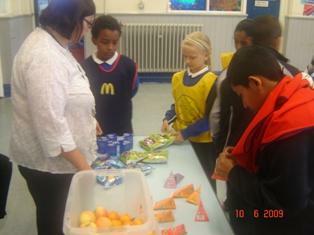 The school Tuck Shop open to years 3 to 6 only sells healthy snacks such as fruit. If children bring tuck from home, it must be healthy; for example fizzy pop is not allowed. Nursery aged children up to Year 2 are given a healthy fruit or vegetable snack with their milk. Pictured is the school's Tuck Shop which is open at playtime. 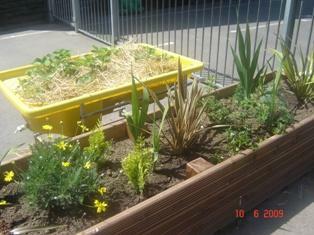 We have been growing plants, fruit and vegetables throughout the school grounds to make it attractive to us and wildlife. Recently the Early Years children have been busy transforming their garden to make it a nicer place to learn and play for themselves and wildlife. Pictured are strawberry plants and flowers they have planted, grown and now take care of. What's your carbon footprint ? A carbon footprint shows how much of the World's resources it takes for you to live.